Vulcan Heating Equipment has had broad experience in the manufacture of steam/hot water unit heaters for many years. Offered in both horizontal and vertical air delivery models, Vulcan unit heaters are a complete heat distributing plant, encased in an attractive, streamlined baked enamel housing. Designed for ceiling mounting, they provide a convenient, low cost method of heating warehouses, stores, factories, and other large open areas. Vulcan, responding to the requirements of the heating industry, has now expanded its unit heater line to one of the most complete in the industry, twenty-three horizontal and fifteen vertical steam/hot water models! Most Vulcan unit heaters are equipped with totally enclosed motors with internal thermal overload, statically and dynamically balanced fans for quiet operation, and with the installer in mind, we designed a versatile hanging system for easy installation! Vulcan horizontal unit heaters are attractively finished in dark gray jackets with light gray air deflection louvers. Vulcan is proud of the reputation it has earned in the hydronic heating equipment market for product quality, design, innovations and customer service. The corporation has pledged its full range of engineering and manufacturing resources toward maintaining an unwavering commitment to the steam/hot water heating equipment industry. The Vulcan Cabinet Unit Heater is the industries most recent design. Years of manufacturing and engineering experience combined with a concern for appearance have resulted in a crisply styled unit that will blend with almost any room decor and provide reliability, durability, individual control and quiet operation. The wide selection of floor, wall and ceiling units with a variety of air flow arrangements allows for exactly matching design requirements. Field repainting to match the decor is possible and factory applied decorator colors are available as an option. Recessed models are provided with a field installed wall seal that allows for full or partial recessing depending on the model. The wall seal is also available as an optional kit for full or partial recessing of most other models. As unit size increases, only the length changes. The depth and height remain constant, thus allowing the designer to have uniformity of appearance when units of various sizes are installed in adjacent areas. The standard 16 gauge front panel is rugged enough to withstand harsh treatment. Exposed cabinetry is provided with a prime coat of neutral eggshell baked enamel, which in many instances can serve as the finish. Back and side panels are 18 gauge. The pedestal base for floor models is painted black and is the height of most mop boards. The solid state speed control provides infinite variations from high to low speed, giving the occupant finger tip control over fan speed and room temperature. Versa-Line Finned-Tube Radiation is Vulcans most versatile and flexible, multi-purpose commercial hydronic heating enclosure line. For over 50 years, it has provided users an outstanding BTU output/penny of cost. Versa-Line offers architects,engineers and contractors a full range of enclosure styles, heights, depths, lengths and element selections. Known in the trade as a reliable workhorse, Versa-Line features include small tube sizes and low water temperature ratings. Versa-Line is used in commercial heating installations – structures that demand good looks, durability and low price. Ideally suited for schools, general office buildings, common walkways and high traffic areas. Versa-Line is especially suited for high heat loss areas, yet is attractive enough to be used in areas with subtle lines and perimeter heating. Versa-Line Enclosures are available in 18,16, and 14 gauge C.R.S., Stainless steel and Aluminum are available options. The enclosures are reinforced with 14 gauge internal gussets and full height vertical slip joint stiffeners making them one of the most rugged enclosures on the market today. All enclosures are press brake formed with hard tool dies to ensure consistent styles, shapes and sizes. Vulcan Dura-Vane…the modern concept of fintube heating…combines the smooth-flowing lines of extruded aluminum with the strength of steel. It is especially designed to complement the linear treatment of contemporary architecture. The miniature fin-tube with the multi-purpose application.In addition to the variety of cataloged enclosure styles and heights, Floorline can be furnished in custom heights tailored for the individual building conditions. Where desired, aluminum or stainless steel enclosures can be provided.Units are available in single lengths to 10’0″. In many cases, such as dormitory rooms, etc., a single unit can be specified thus avoiding interrupted louver pattern at enclosure joints and providing a cleaner, straighter, more rigid installation. With the introduction of fin-tube radiation in America over 65 years ago, Vulcan Radiator provided an entirely new concept in heating.This new concept eliminated homely, inneficient and space-consuming types of radiation and opened broad new horizons of design and construction for architects and engineers.Vulcan leadership continues to pioneer in the field of commercial and residential heating. Through its experienced research and engineering staff, and its skilled production craftsman, Vulcan keeps abreast of modern architectural requirements with a wide selection of elements and enclosures for every requirement. As always, Vulcan quality and efficiency result in significant economies, both in installation and in operation.VULCAN, the name that has become a standard in the industry, is proud to carry the responsibility that leadership entails and pledges a continuance of its policies and practices to assure the ultimate in dependable heating performance. Vulcan’s Security Perforated Enclosures are designed primarily for maximum security applications in prisons and mental institutions.The completely enclosed design, with 1/8″ diameter inlet and discharge air openings, prevents hiding weapons or drugs inside the enclosure as well as withstanding attacks of vandalism.These enclosures are also recommended for use in other heavy-abuse areas such as schools, dormitories, and public buildings. Vulcan Convectors are engineered for both forced hot water and two-pipe steam heating system installation with heating elements of lightweight non-ferrous construction. They are available in (7) basic types to meet a wide range of heating applications in institutional buildings, hospitals, hotels, office buildings, schools, apartments and other structures. A variety of cabinet enclosure styles permits the selection of an a ttractive and functional installation to blend with any building interior -modem or traditional. Designed for maximum flexibility of installation arrangement, Vulcan Convectors are available in free-standing, semi-recessed, wall hung and fully recessed models. Enclosures are formed from heavy-gauge steel, and finished in prime coat for complete protection against corrosion during shipment and providing a base for final finish to meet architectural requirements after installation. The type FS-A Free-Standing Cabinet Enclosure is designed to be used exposed and fitted flush against the wall. Readily installed without alteration of wall interior, The FS-A enclosure is frequently used for system modernization where it is desirable to avoid the expense of recessing the unit in the wall. Arched inlet shown is standard. Unit may be provided with integral inlet grille,(FSG-A). The W-A Convector is a completely exposed wall hung unit with flat top. Outlet grille is in the face of the enclosure. Enclosure front wraps around unit and fastens to sides of cabinet with clips. Air inlet is through open bottom of unit enclosure. Cabinet design is similar to FS-A model. Enclosure projects only 2 1/4″ from wall, Complete unit includes enclosure, front panel with outlet grille and arched inlet opening, heating element. Front panel is easily removed for cleaning or access to heating element. Unit may be provided with integral inlet grille, (SRG-A). This is a partially recessed unit with rounded flange front and venetian type air outlet grille, standard for wall mounting as illustrated. Cabinet extends only 2 1/4 ” from wall. Enclosure front fastens and screws to brackets on unit liner installed in wall recess. Air inlet is through open bottom of unit (PW-A). Unit may be provided with integral inlet grille, (PWG-A). The Type SFA Free-Standing Cabinet Enclosure is designed to be used exposed and fitted flush against the wall. Readily installed without alteration of wall interior, the SF A enclosure is frequently used for system modernization where it is desirable to avoid the expense of recessing the unit in the wall. Arched inlet shown is standard. Unit may be provided with integral inlet grille,(SFG-A). This model is fully exposed wall hung with outlet grille located in sloping top. Enclosure wraps around unit and fastens to sides with clips. Air inlet is through open bottom of unit. Slope of top is 30°. Consult factory for availability with stainless steel. Designed to be fully recessed within the wall. The flanged edge metal front contains the outlet grille and inlet opening and is fastened by screws. It is easily removable for heating element access. The standard unit is arranged for floor mounting with arched inlet opening, (RF-A). Unit may be provided with integral inlet grille (RFG-A shown). 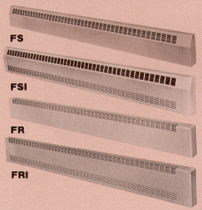 TYPE FWG-A unit is similar, but for wall mounting with integral inlet grille. All units extend 13/16″ from wall. Consult factory for availability of FWG-A models in stainless steel.